Foodie: (n) a person who is passionate about cooking and everything that has to do with food. My mind becomes totally puzzled whenever I hear someone say the words: “I can’t cook”. After giving this negative affirmation a lot of thought, I have come to the conclusion that for anyone to be able to cook they must have at least one of these basic requirements: motivation, creativity and/or know how to read. These requirements are not mutually exclusive because, for example, someone that doesn‘t know how to read can learn if they have motivation and/or creativity and vice versa, if you don’t have the motivation and/or creativity at least you know how to read and just follow the steps to create a fresh, nutritious homemade meal. I’ve left out of the equation the element of time because there are recipes that are very short and recipes that take days, so it is up to you to decide what suits your lifestyle. Born and raised in San Juan, Puerto Rico, I was lucky enough to have many different culinary influences throughout my life either by friends, family or travel. My love of cooking and interest in discovering different flavors started when, as a young girl, my parents would take me with them on frequent trips to places like Egypt, Greece, Spain, the USA among others. My grandparents on my father’s side were Spanish immigrants that came to Puerto Rico in the 1930’s in the middle of the Spanish Civil war. My Spanish grandmother, Mami Chelo, is from Villagarcia de Arousa, in Galicia, a region located north of Portugal. It is a place known for its seafood, stews, celtic influences and is mainly cold and rainy during most part of the year. During one of our trips, I remember vividly when as a young girl vacationing in Villagarcia with my family, we used to visit the local outdoor markets everyday with our cook Nieves to buy the food that we would eat that day. The busy market and the smell of the fresh fish, bread, chorizos, cheeses and vegetables still linger in my soul. As soon as we got home we got busy preparing the next meal in a tiny kitchen with a small refrigerator and a gas stove; everything always simple, fresh and colorful. My grandfather, Papi Bartolo, was from the port city of Soller, Mallorca in the Balearic Islands, a beautiful arid island in the Mediterranean which has a different type of culinary background than Villagarcia de Arousa. A lot of breads like in “coca mallorquina”, pork, crustaceans, olive oil, “ensaimadas” or filled spiral sweet bread, spreadable sausages like “sobrasada” and vegetables are all part of the local ingredients and diet. In addition, through my cousins’ Lebanese grandmother Mami Julia, I was exposed to this country’s cuisine at a very young age, when we would gather on weekends to taste her delicious “kibbe” in different shapes and spend the whole afternoon playing and eating middle-eastern food. The flavorful and delicious typical puertorrican cuisine (which also has many cultural influences) was infused in me by my Puerto Rican grandparents Abo and Ita. My father jokingly says he fell in love with my mother the moment he tried my grandmother’s “arroz con gandules” (rice with pigeon peas). My husband and everyone who has tried it every December 25th at my parents holiday celebration agrees and says it is the best they have tasted in their lives. To tell you the truth, I don’t have a childhood memory of Ita in which she is not cooking, or preparing to cook, or having a party where she is cooking or teaching me how to cook. My grandfather Abo, helped her in preparing some meals by taking the fresh pigeon peas out of the pods, peeling apples, oranges, avocados and green plantains. We still have so much fun together while she passes to me her wisdom both from the kitchen and from life. As a teenager, I began experimenting with ingredients to prepare breakfast and lunch for my two young brothers during the weekends. I started to become more interested in watching my mother and grandmothers prepare their specialties. Always curious and willing to explore new possibilities, I asked for recipes and started to collect cookbooks and cooking magazines at a young age. I must admit that for me, reading a cookbook is like reading a New York Times Bestseller! Reading about food is also a great way of learning about culture, geography and history. After graduating from High School, I went to study Business Administration at The American University in Washington, DC, a multicultural school in a multicultural city. There you can find a restaurant from every country and every region. During the years I lived in DC, Dean and Delucca opened their store in M Street ,Georgetown at the old market building where exotic and different ingredients that could only be found in small specialty shops, now were more accessible to the people living in this wonderful city. On weekends, my friends and I would go to different ethnic restaurants in downtown, the harbor, Georgetown, Adams Morgan, and in nearby towns of Maryland and Virginia, to experiment with new foods and flavors before going to a party or going dancing. That is when I started to look at sushi, Thai, Persian, French and Italian food in a new perspective, got a subscription to Food and Wine Magazine and continued my collection of over 150 cookbooks. 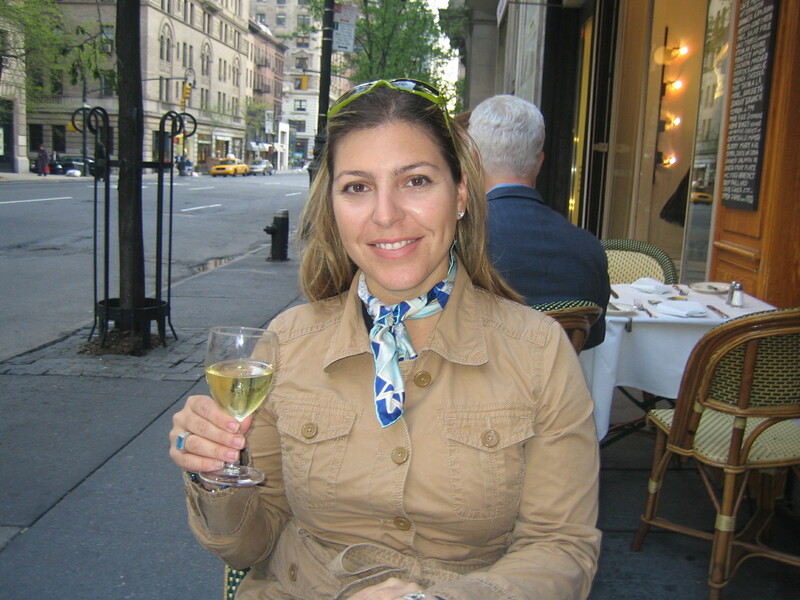 As my love of food started to expand across many cultural frontiers, at the age of 20, I applied to the World Capitals Program for an exchange program in Rome, Italy. All I will say about this experience during Spring of 1994 in which I attended the American University of Rome, is that it exposed me to a new level of culinary devotion. As many of you may know, Italy is a place full of beauty in architecture, art and of course, food. Street food markets, fresh ingredients and colorful dishes can be found everywhere. History in a plate… everything has a purpose. The only exception is gelato which was only created to make you feel happy. In Italy everything goes fast unless you are eating. People work to live but don’t live to work, so it is nothing strange to get kicked out of a store when its time for “pranzo” or lunch and don’t open again until 4pm. At the university, we had the good fortune that the Italian girlfriend of one of our professors came to school to give us basic Italian cooking seminars. The information she gave us was very useful to me because I used it as a guideline to be creative and experiment by adding new vegetables or ingredients I would find at the daily fresh market in Campo di Fiori or at the corner neighborhood “alimentari” in Via della Pace on my way home. My “food critic” for all these dishes was my roomate Yuri and the “kitchen stadium” a closet in the attic we had rented with the smallest gas stove I have seen in my life. 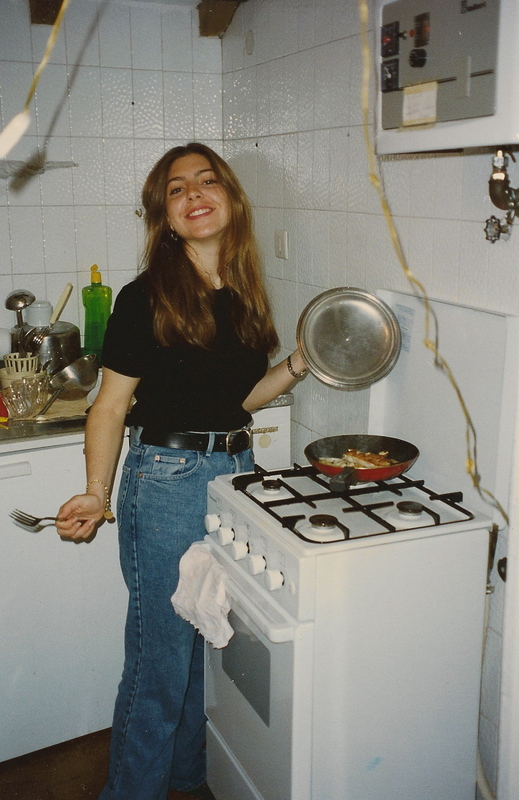 When I returned to Washington, DC to finish my degree, my friend Rafaela, whom I met in Rome, and I moved to an apartment off campus where we had a full kitchen as opposed to the public stove in the dorms. That was my test kitchen for many dishes, but I couldn’t use her as my lab rat because she is vegetarian. Never the less, she was gracious enough to try my rice, pasta and potatoes dishes and taught me to really enjoy sushi and veggie sandwiches. At this point I seriously considered going to culinary school in Europe but the universe has a way of making you follow certain paths, willingly or unwillingly. In December 1995, I returned to live with my parents to my beloved island of Puerto Rico and started working in the marketing department of a local bank. In my spare time I tried experimenting with bread dough, jams and jellies, appetizers, desserts, cookies and fresh pasta and took several cooking and wine tasting classes. In July 1998, I got married after a brief courtship. My husband Emilio and I share a love of cooking and eating. Entertaining at home started to become a party production where almost everything was homemade for our family and friends to enjoy. Initially, at our first apartment then at our first house. Every gathering we tried something new that made it special and unforgettable. Now our kids are getting involved in the kitchen and help out as much as they can. They love to try new flavors and ethnic food as well as traditional meals all kids love. In addition, we try to feed them food that is natural, fresh and colorful. I find great joy in sharing my recipes and culinary adventures. My goal with this blog is to share some of my favorite dishes with fellow foodies as well as to convert new cooks. I never knew that you were so passionate about cooking! I really enjoyed reading the family’s history as seen through your “cooking” eyes. I will look into your blog to pass some of your recipes to Kas…..
Congratulations on your new blog. It looks amazing. It means a lot to me to have been your “food critic”. Love the picture of the good old days with our little gas stove. molto ingraziata, yuri! ci vediamo a presto! Jamas pense que fueras una amante de la cocina!!!! Me encanto el blog y lo visitare a menudo, hay varias recetas que voy a tratar y te dejo saber como me fue. Exito!!!! y sigue postiando recetas para seguir inventando en la cocina. Espero aprender y tratar nuevas recetas. Me encanta como pones fotos y describes los pasas. Ya soy una fan y me suscribi para recibir updates de los nuevos blogs. Me encanto. Un abrazo. Me encanta como presentas las fotos y el contenido de las recetas. Tu narracion personal y familiar es encantadora. Cuentas con mi apoyo 110%! You Go Girl! Un beso grande para ti. I lived on Campo di Fiori!!!! and often whent to Caffe de la Pace on Thursday nights!!!!!! I lived right on the piazza and every morning they would set up the market! I never knew we had so much in comon! Va bene! Non ti dimenticare il GUGG per Ottobre 2010!!!! Ci vediamo a TAW! and now, BLOG ON girl! i won’t forget carmen. still on my plans! hope to see you soon. Me gusto muchísimo tu formato y las fotos. Mi receta de caldo gallego es similar a la tuya, voy a ponerla esta semana. Espero estes bien de tu visita al hospital. gracias sonia. me encanta leer lo comentarios de los lectores y sugerencias tambien asi que no olvides suscribir tu email en el blog para que recibas la recetas semanalmente. espero verte pronto. me divierte mucho leer tu blog. está muy bien escrito. transmite pasión y alegría. gracias por compartir ese amor. a ver si de regreso del supermercado, comienzo a preparar tus recetas. gracias maria reina, i’ll keep them coming! Te felicito por tu gran pasion y trabajo!!!! Me fasino la receta del arroz con amarillitos esa de seguro la hago esta semana y como me fasinan los mantecaditos, como soy tu cuniii preferida,” JAJA! envianolas por UPS, me frusto cada vez que los hagos me salen con suntan, no puedo con ellos, a tus sobrinos les fasinan, besos. gracias. deja ver cuando te los envio. a cambio enviame a mis sobrinos! ja! You do a wonderful job when posting a recipe, your information is clear and to the point, and when I read your recipes I quickly decide, “I can do this”. Great presentation, I see your blog growing exponentially. One thing I would suggest is to add a WordPress widget for people to fully register and be able to follow up comments. Many sites would take a recipe and turn it into Forum thread automatically, thus inviting comments or Traffic if you will. thank you for your comments and suggestions. I will look up how i can do it! leida im glad you became a foodielady . The best thing in life is to enjoy a wonderful meal with people you love . In these times it is wonderful to hear that there are still people that enjoy really the art of cooking , not just popping something in a micro wave. SO thank you so much in creating this site, and post these creations that bring your palate such delight. of course first the creating and then enjoying the meal or salad, or dessert . keep up the good work . hey mrs. geswaldo! you were always one of my favorite teachers!!! i guess your enthusiasm and passion for life hasn’t changed. this year its 20 years that you were my english teacher senior year in high school! ouch! anyway, thanks for your kind comments and hope you visit this site often. let me know if you try making any of the recipes and please, feel free to invite anyone at school you think might be interested in following my posts. kind regards.